Populist movements in the US and Europe have mounted an attack on economic globalization. Their responses to more than a half-century of globalization include leaving multilateral trading blocs, imposing steep unilateral tariffs and striving for balanced bilateral trade. Trade theory suggests that this rejection of today’s open trade regime will impose costs on globalized economies. But using the experience of contemporary economies to assess the magnitude of these costs presents significant analytical challenges because of multiple modes of globalization – investment and migration as well as trade – and substantial technological change. Even if we were able to disentangle the impact of open trade from these other influences, we would still face the issue of identifying the causal impact of open trade. Identification requires a comparison with a counterfactual world without open trade: the longevity of the current period of globalization makes that difficult. Our research addresses these analytical challenges by turning to the globalization of the nineteenth century to examine fundamental theoretical propositions about the causes of and gains from trade. 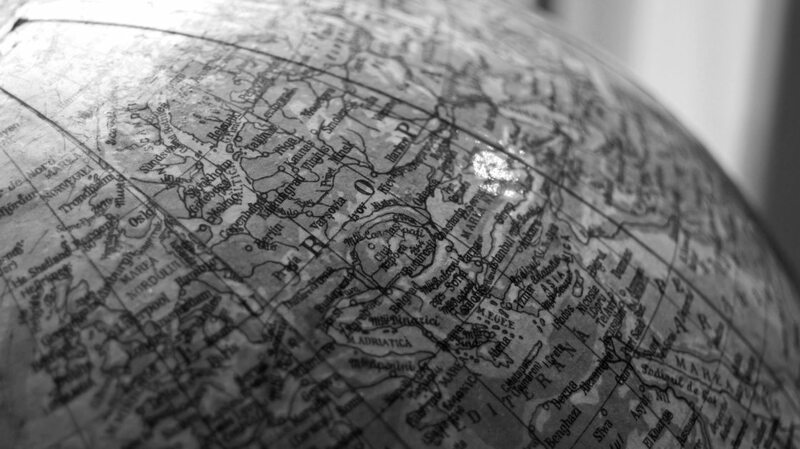 Our research addresses these analytical challenges by turning to the globalization of the nineteenth century to examine fundamental theoretical propositions about the causes of and gains from trade. We focus on an unusual historical episode in 1859, which saw the forced imposition of an open trading regime on a Japanese economy that had long been in self-imposed conditions of ‘autarky’ or economic self-sufficiency. In a series of studies, we have made use of this event as a natural experiment to examine the empirical validity of key predictions of the theory of comparative advantage and to quantify the gains from an open trading regime (Bernhofen and Brown, 2004, 2005 and 2016). The intellectual argument for an open trading regime goes back to David Ricardo’s famous 1817 illustration of the principle of comparative advantage. This implies that countries will benefit if they specialize and export what they are relatively good at producing in return for importing what they are relatively less good at producing. But what determines which products an economy is good at producing? And who is directing the economy to specialize in producing what it is good at? For a modern economy like the US that is capable of producing thousands of goods and services, its comparative advantage can depend on many economic fundamentals: the state of its technology, its resources or the preferences of its consumers. An amazing feature of a competitive market economy is that an economy’s relative market prices in the absence of international trade – that is, in a state of autarky – will capture all the relevant information about the economy’s fundamentals. Consider a simple example. Assume the US is relatively abundant in arable land and relatively scarce in low-skilled labour compared with China. Now if wheat is relatively land-intensive and cloth is relatively labour-intensive, the economies’ relative market prices under autarky would reflect the relative costs of the resources – land and labour – used to produce these two goods. Relative to the price of cloth, the autarky price of wheat would be lower in the US than it would be in China. Opening up both countries to trading with each other would provide an opportunity for the US to import cloth from China at a lower relative price than the price of domestically produced cloth. Importing cloth from China in exchange for exporting wheat would enable both the US and China to consume more of both goods relative to autarky. Our US-China example illustrates the principle of comparative advantage for only two goods. In the case of many goods, the principle of comparative advantage can be generalized so that it still preserves the ‘spirit’ of the two-good formulation. Following Alan Deardorff’s (1980) seminal formulation, the general law of comparative advantage implies an empirically falsifiable prediction: an economy should, on average, export goods with relatively low autarky prices and import goods with relatively high autarky prices. Our example also suggests an explanation for a source of comparative advantage: differences in the relative abundance of land and low-skilled labour. If this logic is extended to the case of many goods and multiple factors, it results in the general Heckscher-Ohlin theorem: an economy should, on average, export the goods that use its relatively abundant factor(s) intensively and import the goods that use its relatively scarce factor(s) intensively (Deardorff, 1982). In a state of autarky, relative factor prices are sufficient to describe their relative abundance. The theorem thus yields an empirically falsifiable prediction on the pattern of the factor services embodied in goods trade, also known as the factor content of trade. A tacit assumption lies behind these two predictions. 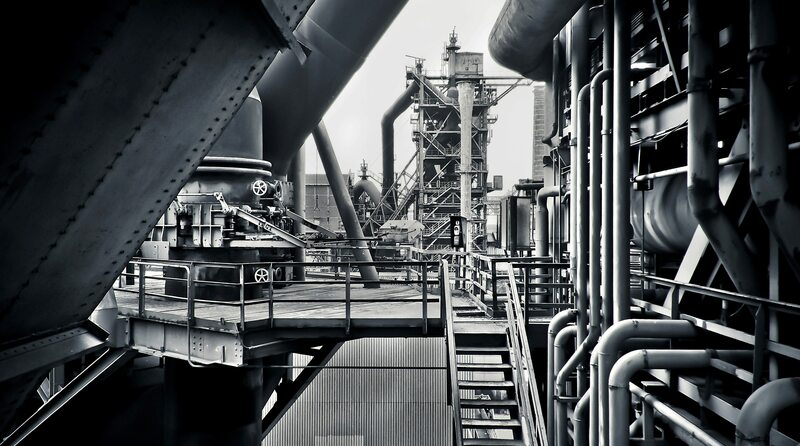 Market forces – Adam Smith’s notion of the invisible hand – will increase the potential for an economy to realise the benefits of trade by allocating an economy’s resources in the direction of comparative advantage. Hence, tests of these predictions can be viewed as tests of the efficacy of the market system. All of these predictions require knowledge about market prices in a state of autarky, but such data generally do not exist. During the twentieth and twenty-first century, market economies have operated primarily with open trading regimes. Economies operating under conditions of autarky have been command or war economies. Nineteenth-century Japan offers an example of a market-based economy operating first under autarky and then under free trade. 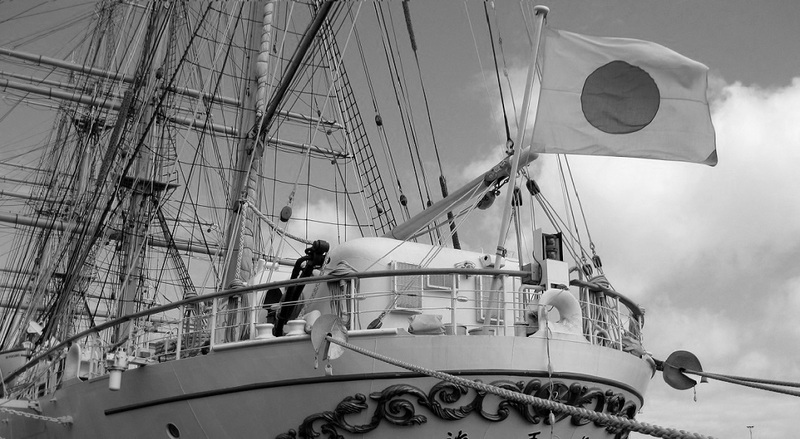 Cut off from virtually all international contact for over two centuries, Japan was forced by the western powers to join the international economy in 1859. Known as sakoku or seclusion, Japan’s autarky regime began in 1635 when its Tokugawa rulers imposed draconian restrictions on all contact with foreigners. The only foreigners with ready access to the Japanese empire were Chinese and Dutch merchants. Sequestered in isolated compounds in Nagasaki, they were only allowed to conduct very limited – and dwindling – trade with designated officials once a year. By the time that US Admiral Perry and his fleet of warships appeared in Tokyo Bay in 1853, Japan had a population of 30 million. Market exchange dominated its economic development under autarky. Efficient coastal transport facilitated regional specialization and an integrated domestic market. A dense network of merchants, wholesalers and commodity markets knitted together vertically specialized farmer-producers and small firms based around master craftsmen. Former imports such as raw silk and even sugar were produced domestically. Japan’s opening to trade was involuntary and abrupt. Western military pressure and the British defeat of China in the First Opium War prompted Japan’s rulers to capitulate to western demands to open its markets. The ‘unequal’ treaties signed in the summer of 1858 required Japan to allow trade by 4 July 1859. The treaties capped tariffs and export taxes at 5% of the value of goods and granted western merchants access to several ‘treaty’ ports, which also served the most lucrative markets of the interior. First, goods and factor price data from the autarky regime generally reflected competitive market conditions. 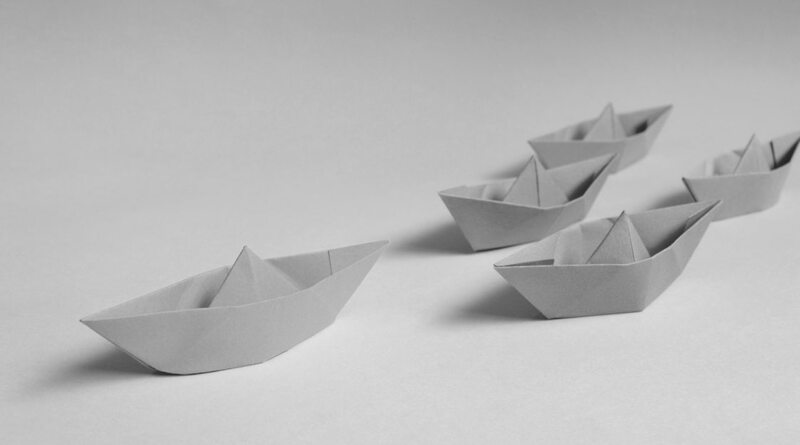 Second, the transition from autarky to an open trade regime was so rapid that we observe few significant changes to the fundamentals of the economy – technologies, factor endowments and consumer preferences – during the first 20 years of trade. Despite formal feudal structures, by the 1840s, Japan was a sophisticated market economy where primarily homogeneous products were produced under highly competitive conditions. Autarky price quotes from major commodity markets in Osaka and Tokyo supplemented with transactions-based price data from merchant, firm and farm account books and the records of the Dutch East India Company cover most of Japan’s traded goods. Figure 1 illustrates the magnitude of the trade price shocks for several key exports and imports. By 1869, the price of Japan’s main export – silk industry products – had doubled in real terms; many importables saw price declines of 30-75%. The sources also record market wages during the 1850s. Regionally based studies document the equivalent of land rents and prices for the last years of autarky. Data on capital usage from primary sources and published series on interest rates permit calculation of the user cost of capital under autarky. Given the highly developed commercial structure and efficient coastal transport, domestic producers responded adroitly to export opportunities even as foreign goods rapidly penetrated Japanese markets. By the mid-1870s, the ratio of imports to GDP was almost 4%. Historians have shown that during our narrow time period of interest (1865-1876), traded goods were for the most part compatible with or substitutes for the goods produced during the late autarky period. For the first two decades of open trade, the economy’s fundamentals registered limited changes. Steam-powered technologies were employed in only a few coal and copper mines. Modest population growth led to only a small increase in the supply of labour and net outmigration was minimal. Foreign direct investment was restricted to a coalmine and foreign borrowing was limited to the Meiji government. Some residents took to wearing western novelties such as watches or bowler hats, but the preferences of the vast majority of the consuming public remained stable. In brief, because the case of Japan fulfils all the critical assumptions and the condition that all other things remain equal needed for the comparison of autarky and free trade, it provides a unique historical opportunity to test the predictions of standard trade theories. For our comparative advantage tests and our estimates of the gains from trade, we analyse product-level data on imports and exports from official trade data and the reports of western consuls and trade missions. The product-level detail allows matching with autarky price data. About 300 primary sources in Japanese and Western languages provide the data necessary to construct product-level measures of factor use based on five factors: capital, land and three types of labour. Value chains in the nineteenth century were uncomplicated so we can account for the contribution of key imported intermediates such as raw wool and cotton to total factor usage. These data cover 95% of exports and 80% of imports by value. In Bernhofen and Brown (2004 and 2016), we present the results of the comparative advantage tests. 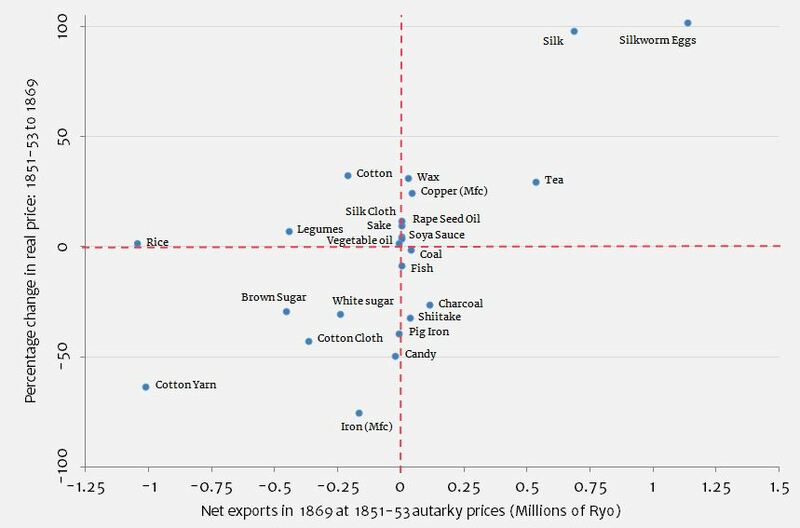 Consistent with the theoretical predictions of comparative advantage, we find that in each trade year from 1868 to 1875, Japan exported products with relatively low prices during autarky and imported products that had relatively high autarky prices. The Heckscher-Ohlin predictions for the factors of production embodied in goods trade flows are also confirmed for each year from 1865 through 1876. Our estimates of the trade in factor services reveal that Japan was a net importer of its relatively scarce factor, such as land, and a net exporter of its relatively abundant factors, such as labour. These results are robust to adjustments for balanced trade and potential measurement error in goods prices, factor prices and factor usage. Our empirical confirmations of these predictions for trade in goods and factor services provide a strong affirmation of standard theories of comparative advantage. They also provide insight into contemporary efforts to quantify the gains from trade. Following the pioneering work of Eaton and Kortum (2002), the last 15 years have witnessed the rise of a new structural trade literature aimed at quantifying the gains from trade, which is summarized in Costinot and Rodriguez-Clare (2014). A tacit assumption of structural estimation is that the underlying behavioural model is ‘true’, which implies that the estimated structural parameters and the corresponding counterfactual gains from trade computations are conditional on this assumption. Although quantitative trade models come in different forms, the neoclassical trade model under perfect competition has played a dominant role in this literature. Because our empirical tests validate the behavioural predictions of the neoclassical trade model, they justify employing it to compute counterfactual estimates of the gains from trade. Data on an economy’s autarky prices and trade flows provide sufficient information for calculating estimates of an upper bound to the gains from trade (the change in income that would have the same effect on welfare as the change in prices) in a market economy. In Bernhofen and Brown (2005), we calculate these gains for each trade year from 1868 to 1875. Employing alternative assumptions from the historical literature about Japan’s GDP allows us to estimate the relative magnitude of these gains. For the early post-autarky period, we find that they were about 7% of GDP, which is higher than predicted by the new structural trade literature. Bernhofen, Daniel M. and John C. Brown (2004) ‘A Direct Test of the Theory of Comparative Advantage: The Case of Japan’, Journal of Political Economy 112(1): 48-67. Bernhofen, Daniel M. and John C. Brown (2005) ‘An Empirical Assessment of the Comparative Advantage Gains from Trade: Evidence from Japan’, American Economic Review 95(1): 208-25. Bernhofen, Daniel M. and John C. Brown (2016) ‘Testing the General Validity of the Heckscher-Ohlin Theorem’, American Economic Journal: Microeconomics 8(4): 54-90. Costinot, Arnot and Andres Rodriguez-Clare (2014) ‘Trade Theory with Numbers: Quantifying the Consequences of Globalization’, Chapter 4 in Handbook of International Economics Vol. 4 edited by Gita Gopinath, Elhanan Helpman and Kenneth Rogoff. Deardorff, Alan V. (1980) ‘The General Validity of the Law of Comparative Advantage’, Journal of Political Economy 88(5): 941-57. Deardorff, Alan V. (1982) ‘The General Validity of the Heckscher-Ohlin Theorem’, American Economic Review 72 (4): 683-94. Eaton, Jonathan and Samuel Kortum (2002) ‘Technology, Geography and Trade’, Econometrica 70(5): 1195-1235.